I thought I would share one of our favorite recipes that would work great for a Super Bowl party. Everyone here in Indianapolis is gearing up for the big game this weekend, so party food is on my brain. The meatball recipe is from The Meatball Shop Cookbook, but I did make a couple of small tweaks to the original. The dip recipe is our own creation. We kept playing with different recipes for blue cheese dressing/dip until we came up with something that was lower in fat. I'd love to hear about it if you try them out! -Preheat your oven to 450 degrees. Liberally spray a 9x13 baking dish with cooking spray. -Melt the butter in the microwave or in a saucepan over low heat. Add the hot sauce and stir until smooth. Allow to cool. -Combine the hot sauce mixture with all other ingredients in a large bowl. Fold all ingredients together with your hands until thoroughly combined. -Roll the mixture into small balls, approximately 3/4" in diameter. I use a very small ice cream scoop and then roll them in my hands. Line the meatballs up in rows in the baking dish, making sure the edges are touching each other. -Roast for about 20 minutes until the meatballs are firm and cooked through. The internal temperature should read at least 165 degrees. -Allow to cool slightly before serving. If you like things a bit spicier, brush the meatballs with extra hot sauce before serving. **I have made these the day before and they turned out perfectly. I rolled the mixture into balls, laid them out in the pan, covered tightly with foil in the fridge, and baked the next day before the party. Mix all ingredients together until combined. Top with green onions before serving. I think that this dip tastes much better if you have time to make it the day before and keep it in the fridge overnight! 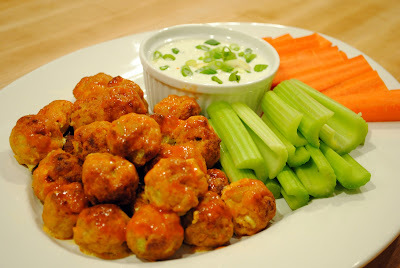 Hi Jamie, This plate of chicken meatball and dip looks fabulous! Thanks so much for sharing! Yum! My family loves my boneless buffalo wings, but they are so time consuming. These will have the same flavor without such a chore. Baking instead of frying is more healthy too! Thanks! These look yummy!!!!! I am definitely going to try these!!!! I saw your link on the Weekend Wrap Up Party, and am excited to see a healthier take on buffalo chicken and the dip! I've never used ground chicken, but I'm sure it would be good. These look so yummy! I so need to try these out. My hubby would love these! I just wanted to let you know that I featured you today on Blissful and Domestic!